There were 626 press releases posted in the last 24 hours and 153,965 in the last 365 days. /EIN News/ -- KEMP, Texas, Dec. 06, 2018 (GLOBE NEWSWIRE) -- Leader in industrial lighting, Larson Electronics LLC, has announced a new addition to their explosion proof lighting line, an LED string light in a daisy chain configuration, suitable for hazardous locations that deal with volatile compounds including hydrogen such as: manufacturing plants, explosive storage centers, agricultural sites, petroleum refineries and more. The EPL-SL-9-50X-150LED-B-IBC is a superior lighting solution for hazardous locations that handle volatile compounds, including hydrogen. 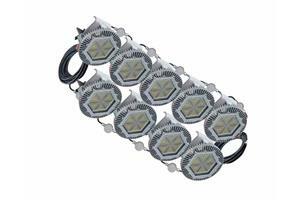 Made up of nine LED lamps in a daisy chain configuration, the 1,350-watt unit provides 90,000 lumens of white light. The EPL-SL-9-50X-150LED-B-IBC from Larson Electronics offers powerful illumination in industrial buildings that work with explosive compounds. This IP67-rated string light is designed for Class I, Divisions 1 & 2; Class II, Divisions 1 & 2; and Class III, Divisions 1 & 2 work sites – with a large focus on hydrogen production facilities (Group B). This LED fixture consists of nine lamps that produce a total of 90,000 lumens of bright white light and a 6,000K color temperature rating. These powerful LEDs directly replace 400-watt temporary metal halide fixtures, and a special heat dissipating design helps this unit achieve a 60,000+ hour rated lifespan with 80% lumen retention. This explosion proof fixture is constructed of copper-free aluminum, while the lamps are power coated for additional durability and attractiveness. A 500 foot 10/3 chemical and abrasion resistant SOOW cord included with this LED string light is fitted with an explosion proof cord cap for easy connection to an explosion proof outlet. Plug options include a 5-15 15-amp straight blade plug for use with 120V explosion proof outlets, a 5-20 20-amp straight blade plug for use with 120V explosion proof outlets, or a 6-20 20-amp straight blade plug for use with 220-240V explosion proof outlets. Each of the nine LED fixtures has an I-beam mount clamp allowing the lamps to be moved and mounted to different points within 50 feet of each other.